Google Play Music has long been the go-to source for picking up the latest single from your favorite pop-singer or set of tracks from your favorite band, but starting today the service will be home to another source of popular audio content: podcasts. Google announced today on its Official Android Blog that podcasts are now welcomed to the service and will benefit from the same bevy of features other audio sources have enjoyed the past few years. Namely, that means you'll be able to stream like-minded podcasts one after another, and aims to "connect new listeners with podcasts based on what they're doing, how they're feeling, or what they're interested in". So far, only a small portion of the most popular podcasts have signed up for the service (the post specifically mentions This Week in Tech, Star Talk, Nerdist and Tim Ferriss), and as of the time this piece was published, they have yet to show up on the storefront. 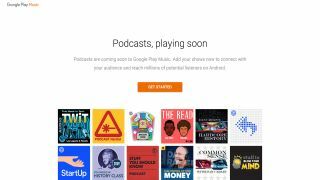 Regardless, Google Play Music's step into the podcasting scene is a major acknowledgement of podcasts' growing popularity, giving listeners a single integrated solution for all of their listening needs. The Chromecast 2 review you have to read.